In this tutorial we will focus on implementing Basic Draughts Rules. In the example, you can see there are three checkboxes on the BasicDraughtsRules component that represent the draught-specific rules discussed here. We will use the following configuration to test the rules. 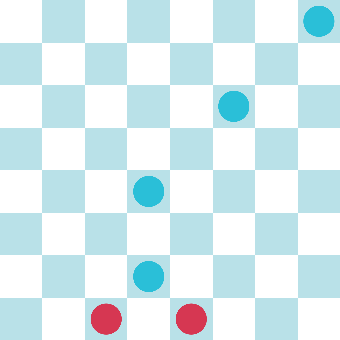 If you try the game with all checkboxes checked you will play a game with the normal draughts rules, Red starts the game so you are obligated to capture the closest blue piece, and, if you move the right piece, capture all the pieces all the way up. Obligation To Capture: If any of your pieces can capture a piece it must do that movement. Multiple Capture Moves: If after a capture your piece can capture another one, it must do that movement. 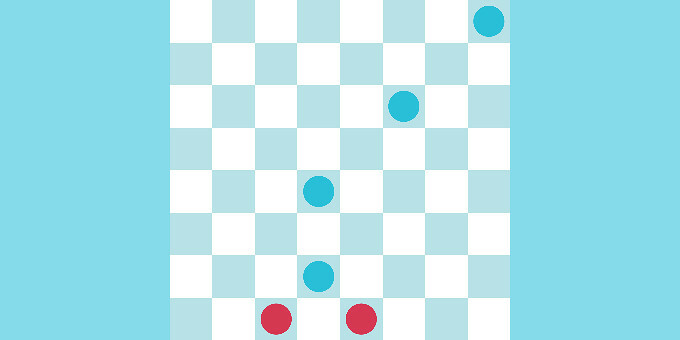 Advance Turn On Empty Move List: Your turn does not end unless you move a piece and that piece does not have any valid movement after its first move. If you uncheck the “Obligation To Capture” checkbox you will see that now you can move to any valid position even if your actual position allows a capture. When this box is unchecked, the rule extension is deactivated so only the general piece rules (as configured on the piece) apply. If you re-check the “Obligation to Capture” and now uncheck the “Multiple Capture Moves” you will notice that you can only capture one piece and then your turn is over. To switch of only the last rules, you need to set the Moves Per Turn field to 1. By unchecking this box, the custom turn advancement is deactivated, and the default is used. But the default rule requires a positive moves per turn. If you play with this configuration you will noticed it works as if you do not have the Multiple Capture Moves checkbox checked. This is because the normal Grid Game Rule for ending the turn (with a value of 1 in Moves Per Turn) happens after a valid move is done, ignoring the Multiple Capture Moves behaviour. How does this work on the Script? The three bool variables that control the rules are here only for the purpose of this tutorial, usually you just need to extend the methods without the need of a bool to control whether to apply the rule or not. (Although this idiom can be useful for prototyping different rules). We recommend to call the base method of every overridden method so you actually expand the behavior already defined. The UpdateMovesForPlayer uses the movesList parameter to check whether there a CapturePieceMove, and if there is it will remove all moves that are not capture moves from the moveList. In OnMoveEnd, if the moveList is clear, a check is performed on the EndedMove (the move that would usually end the turn). If it was a CapturePieceMove then it is necessary to check for new available capture moves and add them to the moveList. For the OnAllMovesEnded all that is needed is to check whether the moveList is empty or not to advance turn if it is. (For this to work, the mmoves per turn must be set to 0 in the inspector). You can tweak this example and add more rules so you can test how it all works.